When you’re being undercut by all OTAs, Price Check won’t appear on your website. We felt like this was a bit of a wasted opportunity - there’s a customer on your website who is interested enough in your hotel to have run a search. Even if you’re not currently in parity, it’s still worth trying to convince them that direct is best, right? That’s why we’ve introduced a new kind of message to the Message Builder. 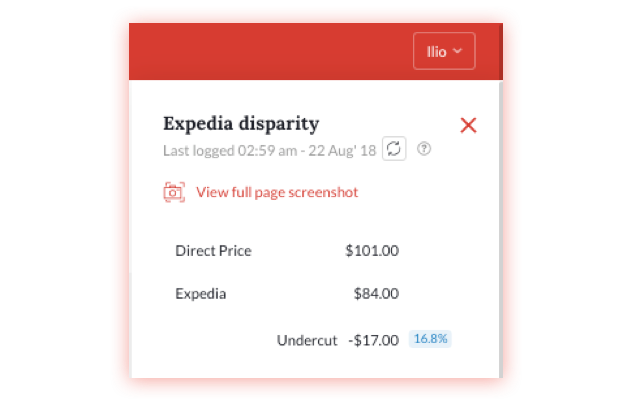 It’s called a Pricing message, and it will display on your booking engine rooms and rates page where Price Check would usually display if you weren’t being undercut. We’ll be doing lots more work on this type of message over the next few weeks, with additional Pricing message options for when you’re in parity or when OTAs have no availability, plus template ideas to help you get started. Watch this space! One of the features that is most regularly requested by our clients is to be able to configure which OTAs appear on both Price Check and in the Disparity Dungeon, and which are sent only to the Dungeon. This is because some of our clients don’t want certain OTAs to appear on Price Check at all, even when they are in parity or offering a cheaper price direct. 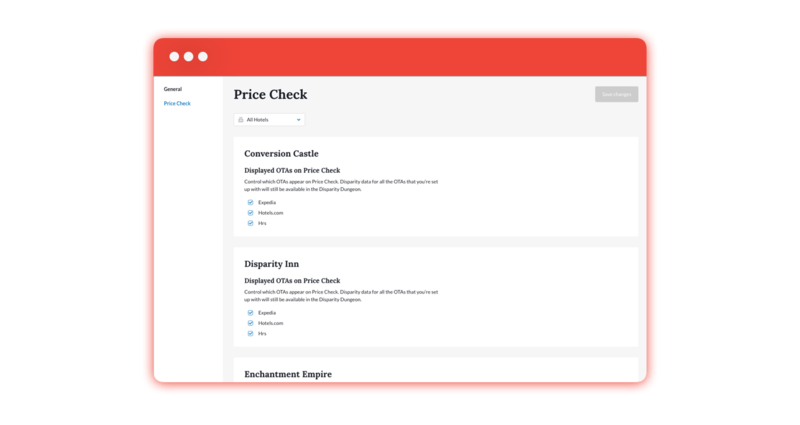 We’re pleased to say that you can now head over to a dedicated Price Check Settings page to select which OTAs will appear on Price Check, and which will just appear in the Dungeon. You can configure this at property level, so if you’d like to display certain OTAs on Price Check for some of your hotels but not all, you can do that. Use the dropdown selector at the top of the Settings page to find the right hotel. As ever - we love feedback! Get in touch if you have any questions or comments about our latest update. The majority of booking engines provide insights into the most frequently booked dates for hotels. This means hoteliers can see which dates are most popular - but only after the bookings have been made. However search data gives a much stronger indication of booking demand, and does so before that demand is realised as a booking - but this information is not widely available to hoteliers. Until now. In order to help you most effectively use the check-in date targeting functionality within Message Porter, we’ve now added most searched check-in dates to the Insights Dashboard. This will help you plan accordingly for the usual increases in bookings around particular dates and holidays, but will also allow you to spot sudden spikes in interest around unexpected dates too. Whether it’s the first year of a new industry conference in your area, extended dates for a popular show or a one-off exhibition that you were not aware of, you’ll now be able to spot unusual activity and target those website visitors accordingly. You could also use this data to create messages that target potential guests during periods of reduced search demand. Now that you can clearly see when your spikes are, you can target the quieter periods with special offers to drive up bookings. Let us know what how you’re using this new data to drive up revenue and, as ever, we’d love to hear your feedback! When investigating your current disparities, it can be frustrating to spend time re-running the search on your website to then find out that the disparity no longer exists. That’s why we’ve now made it easier to ensure you’re only ever seeing disparities that are live and existing right now. You can now recheck a disparity before you begin trying replicate it manually so that you don’t waste time on disparities that are no longer a problem. Just click the refresh icon next to the date in the disparity information panel to automatically recheck it. If it no longer exists it will auto-archive and move to the Archived tab, or if the disparity is still live it will move to the top of the Disparity Dungeon as if it has just occurred. If for some reason we are unable to perform the automatic recheck the disparity will stay as it is. You can recheck a disparity once every 15 minutes. This is the first step in some new functionality within the Dungeon to help make automatically rechecking as simple as possible - look out for more news about this very soon! Deciding exactly what kind of marketing message to send to your guests can be tricky sometimes, so we’ve created a gallery of nudge message templates to help you get started. 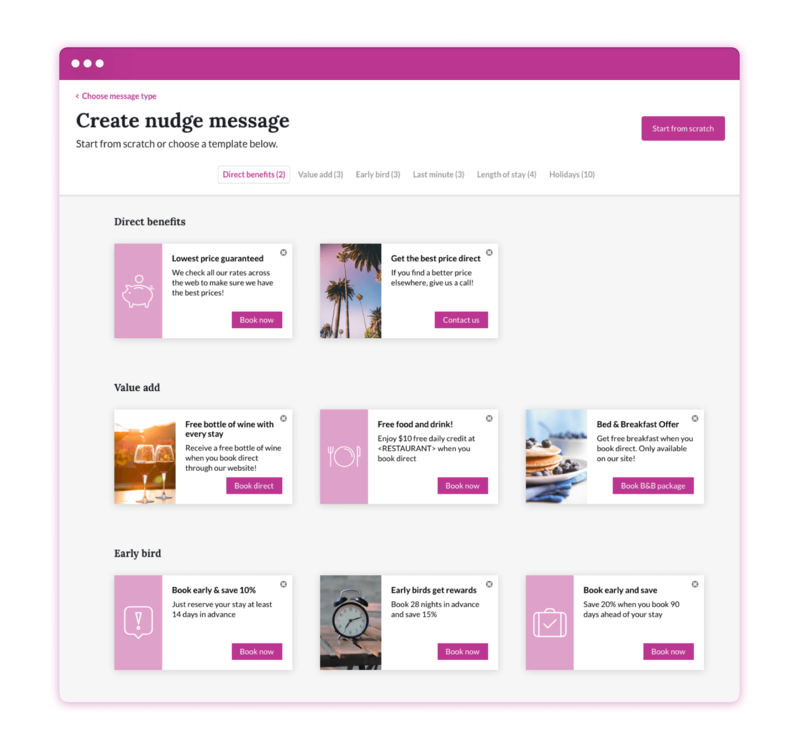 Now when you click to create a nudge message in the message builder you’ll be given a range of pre built ideas to choose from. These include options for promoting your direct booking benefits, value adds for bookings direct, early bird and last minute offers plus seasonal and holiday ideas too! 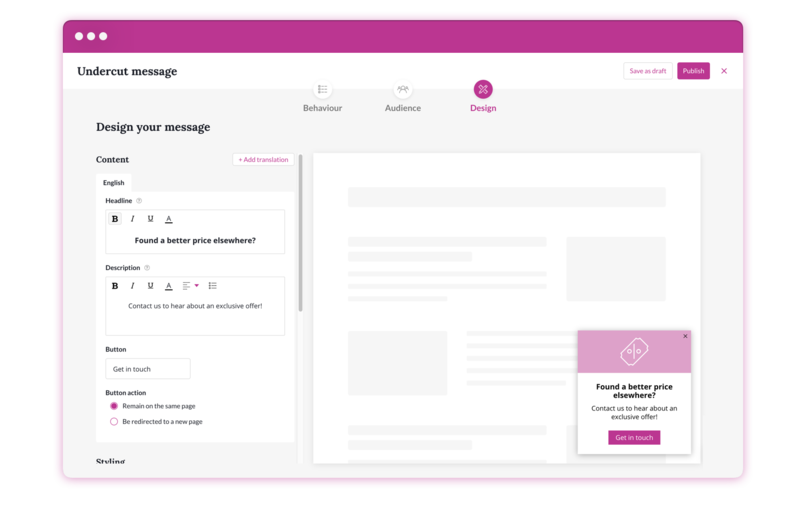 You’ll still be able to set your own Behaviour and Audience specifications, plus if there’s anything you’d like to edit about how our templates look you can do that by clicking into the Design section and making your changes. And if you’re feeling super-creative and want to build something completely unique just click Start from scratch in the top right hand corner to create your own masterpiece! We want to make it easy for you to see which country’s visitors have the highest conversion rate, number of bookings and highest average booking value on your website. This is so that you can understand where to focus your targeted messaging, and also where the highest ROI might be in terms of the traffic you acquire through third parties. We’re pleased to say that the latest data that we’re now displaying in the Insights Dashboard is performance by visitor country. This shows you your global totals for Visitors, Direct Bookers, Conversion Rate and Average Booking Value. 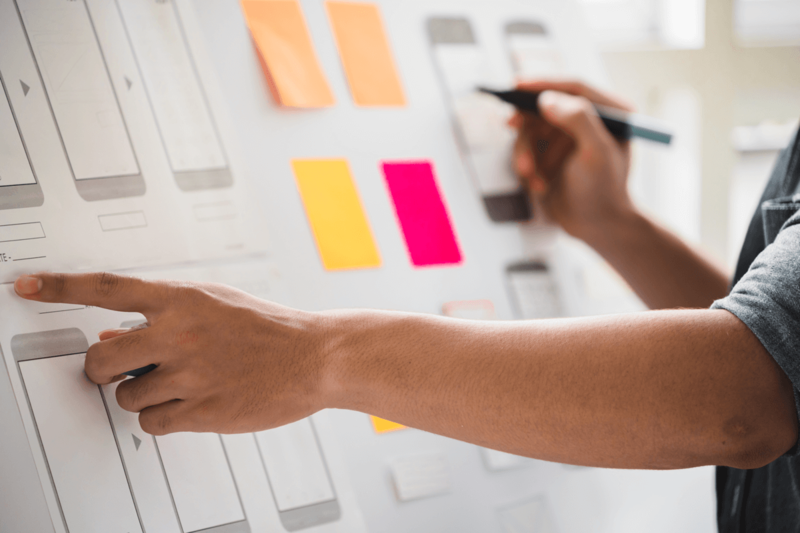 We’re hoping that providing this information will mean you can start running some experiments on your website traffic to see if you can improve conversions. For example can you boost bookings from the lowest performing countries by showing them a targeted offer via Message Porter? You could also try targeting customers from countries with high conversion rates or ABVs to see if you can convert more, or deliver more revenue per booking. We’re really interested to see how you’ll be using this new data to understand which customers are bringing you the most value, and how you can target different segments to increase your direct bookings. If you’d like to discuss your ideas in more detail then get in touch with our Customer Success Team.